Along the togher (ancient trackway) from St Manchan's Church to St Mella's Cell is a holy well. Legend says that one day the saint was thirsty and there was no water at the monastery. He struck a rock and a spring well bubbled up. 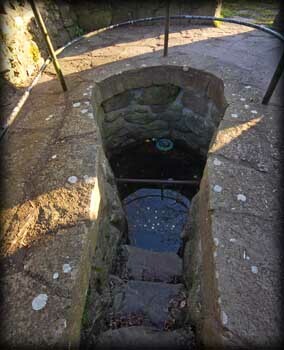 However, St. Manchan's well was more than likely a sacred well since pagan times. Tradition has it that when you are sick you should pray here, walk three times round the well, and then leave a votive offering in gratitude to the saint in the window of the church. 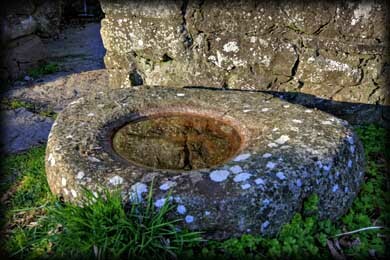 It is claimed that many people have been cured of ailments after visiting the well. When the well was renovated in the 1930's, four upright graveslabs in a cruxiform pattern were discovered. These graveslabs are now housed in the visitor centre (schoolhouse). 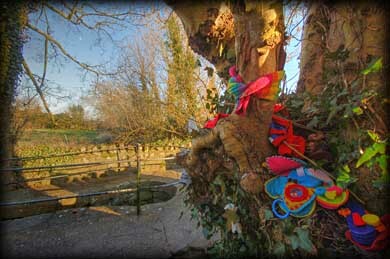 A rag tree near the well displaying clooties is pictured right. Usually the rags are placed there by people who believe that if a piece of clothing from someone with an ailment is hung from the tree, the problem or illness will disappear as the rag rots away. At the entrance to the well is a very large bullaun stone similar in size to the one situated at the road junction where we parked the car. The whole complex at Lemanaghan has a wonderful ancient feel to it, from the moment we stepped out of the car we could feel something special. The atmosphere we experienced here was to increase as we moved along the togher to St Mella's Cell. Situated: From Lemanaghan church, take to togher to the right. The well is situated along the togher on the right hand side. Discovery Map 48: N 1715 2695. Last visit March 2011.